Brain Power led home a one-two for Nicky Henderson in the Wessex Youth Trust Handicap Hurdle at Ascot in the hands of David Mullins. Sternrubin, who dead-heated with the re-opposing Jolly's Cracked It for victory 12 months ago, ensured a strong pace from the off, but he had run his race before the home turn and dropped back through the field very quickly. Brain Power, sent off at 12/1, was well placed behind Fergall who was at the head of affairs turning in and the pair opened up a commanding advantage heading to the last. When they emerged from the fog, Brain Power was in front and he came home a comfortable winner with stablemate Consul De Thaix, who had finished second to the winner on their preceding start as well, collaring Fergall for minor honours. The well backed 4/1 favourite Golden Spear came from off the pace to finish fourth. Mullins said: "Two miles really suits. He goes flat to the boards and really stays. His form was good and Nicky had him spot-on." 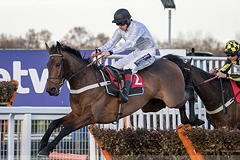 Henderson said: "It's been a great race and is one of those big pre-Christmas handicaps that are very tough to win. "You need a progressive horse, I think, and that is exactly what they (Brain Power and Consul De Thaix) both are. "Brain Power was very good at Sandown and has won two good prizes. They were first and second there and they've been first and second again. "You'd be worried they didn't have the experience for a race like this, running against seasoned handicappers, but both of them were very good." Winning owner Michael Buckley added: "He did win very well. "He's had his little moments of being a schoolboy about life and he's obviously growing up." Brain Power could now be aimed at the Betfair Hurdle at Newbury. Henderson said: "With that weight, that is a very good performance - it is a serious performance. "We were going to chasing with him this season but his mind isn't ready for all this yet. But he has grown up a lot and it has grown up a lot from Sandown. "He is getting the idea of it. We are learning a lot about him and he is going the right way. He just wants minding a bit more. We will have a bit of fun thinking about where we go next. "You could say Newbury, but the handicapper will have his say."